Are you confused by the plethora of virtual-something acronyms like VXLAN, VEPA, VN-Tag or VM-FEX? Would you know which one would be the best choice for a network supporting server virtualization? How about a data center supporting Infrastructure-as-a-Service (IaaS) cloud services? Integration of virtualized networking with physical networks. 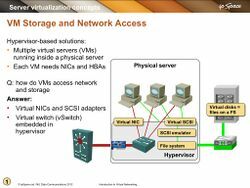 The introductory section describes various server virtualization approaches and focuses on the most common one – hypervisor-based server virtualization. It also addresses the need for hardware abstraction that leads to soft switching and depicts various methods used by hypervisor vendors to connect multiple virtual machines running in the same physical server to the outside world. The ability to move running virtual machines between physical servers for load optimization or maintenance purposes is one of the major advantages of server virtualization. VM mobility imposes strict requirements on underlying network architecture – source and destination host have to be in the same layer-2 subnet due to the limitations of the TCP/IP protocol stack. This section describes various solutions to the workload mobility challenge and technologies (EVB/802.1Qbg, VN-Tag, VM-FEX, 802.1Qbh, VM tracer) that can tightly integrate hypervisors and physical networks. Simple VLAN-based networks rarely scale to the extent required by IaaS services and although large-scale layer-2 solutions exist in Service Provider environments, the same designs almost never get used in data center networks. Use MAC-over-IP or IP-over-IP solutions like VXLAN. All three approaches are described in this section. Isolation between IaaS tenants (or between servers with different security requirements in a private cloud) is almost always a fundamental design requirement. You can solve it with virtual subnet-based isolation (using either VLANs or technologies like VXLAN) or with virtualized firewalls like vShield App from VMware or Virtual Security Gateway (VSG) from Cisco. Both approaches are outlined in this section. I am completely on the Network side of the house and understand what I need to build for Storage/Data replication, but I really never thoroughly understood why. This allowed me to have a coherent discussion with my counterparts in DB and Storage and some of the pitfuls that can occur if we try to cowboy the network design. Great view on infra, Ivan applies common sense (rare super power) on common problems in and around the datacenter. Definitely worth the investment (both in money and time). Insufficient emphasis placed upon abstraction of physical resources as a means to virtualisation of networks. (1) In "Scaling VLANs", I doubt that the justification of use of VEPA "some NIC vendors thought that it doesn't make sense to implement a full-blown switch in the NIC like Broadcom did"...etc. I would think that it has to do with filtering and accounting for intra-host traffic using means implemented in the physical switches. (2) A minor detail: In "Virtual Networking 101", at time stamp 17:32, the phrase "when you move the hypervisor from left to right" needs to have "hypervisor" substituted by "VM". (a) the pronunciation of the word "very" is consistently made to sound like "where-y". (b) generally, "and so on and so forth" sounds more pleasing than "and so on and so on." If you are a network architect, designer or sales/support engineer considering the move to data center, server virtualization or IaaS technologies, you simply have to attend this webinar. To attend this webinar, you should be familiar with the basics of layer-2 switching, VLANs, IPv4, IP routing and Internet-related protocols (DNS and HTTP). 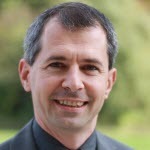 The Introduction to Virtualized Netowrking is a 1,5 hour technical presentation. You can buy its recording immediately; we can also organize an on-site event, where the topics of this presentation are combined with in-depth discussion of other Data Center networking topics that apply to your network.